The focus will be to collect money and the Super 6 food items (canned soup, canned stew, canned vegetables, cereal, tuna and peanut butter). Expired items cannot be accepted. One in six people in Northeast Ohio don't know where their next meal will come from, so the need is great. For every dollar donated, the Food Bank can help provide four nutritious meals. The Harvest for Hunger campaign is one of the largest food and fund drives in the U.S. The Greater Cleveland Food Bank serves people in six counties (Cuyahoga, Ashtabula, Ashland, Lake, Geauga and Richland). 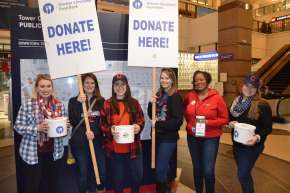 Customers and baseball enthusiasts heading to the Indians Home Opener via RTA can drop off their donation with volunteers from RTA and the Greater Cleveland Food Bank. You can also make a credit card donation at RTA's virtual food drive page.